WSU Small Farms Team is here to help! 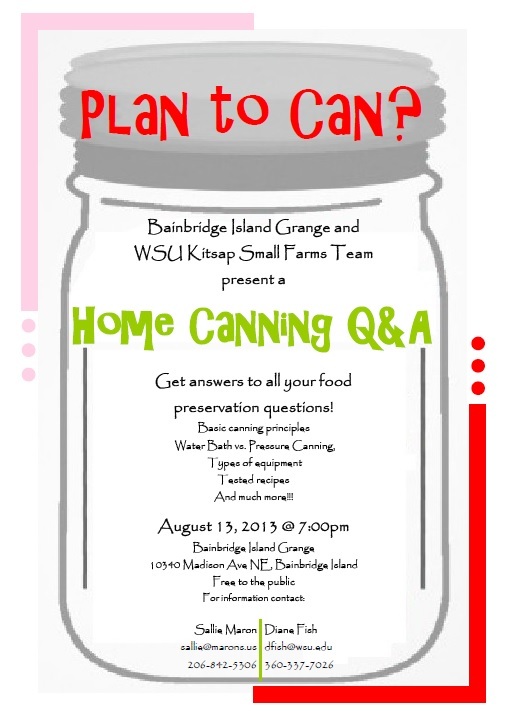 The Bainbridge Grange has invited us for a Home Canning Q&A on August 13th at 7:00pm! 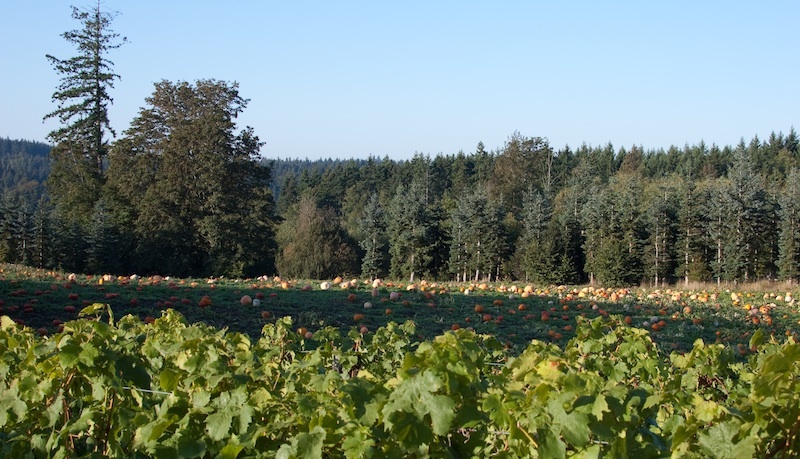 The grange is located at 10340 Madison Ave NE, Bainbridge Island. Topics covered will include basic canning principles, water bath vs. pressure canning, types of equipment, and approved recipes and resources. Pressure gauge testing will be available at the workshop for $5.00. Whether you are just getting started or would like to update your knowledge of home food preservation, join us and learn! If you can’t make it to the workshop WSU is available to answer food safety and preservation questions by e-mail or phone. 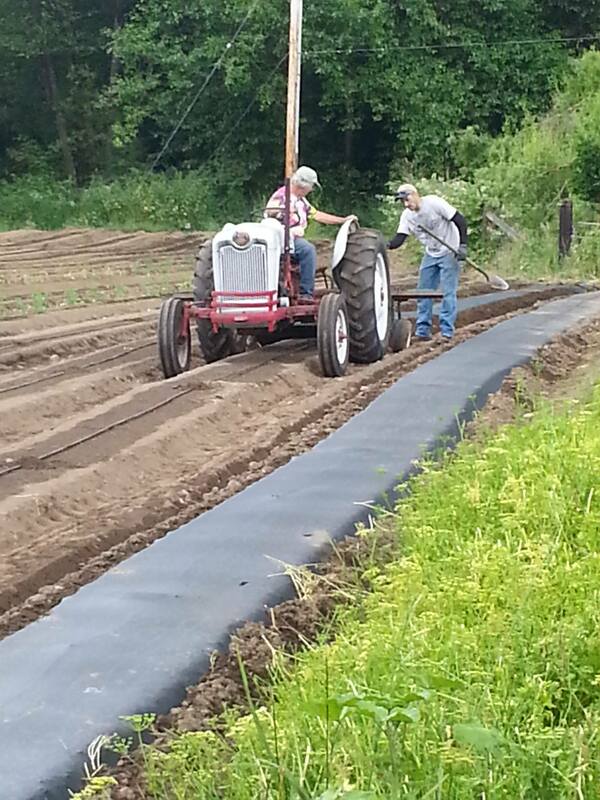 Contact Diane Fish (dfish@wsu.edu) or call the Small Farms Program at 360-337-7026. 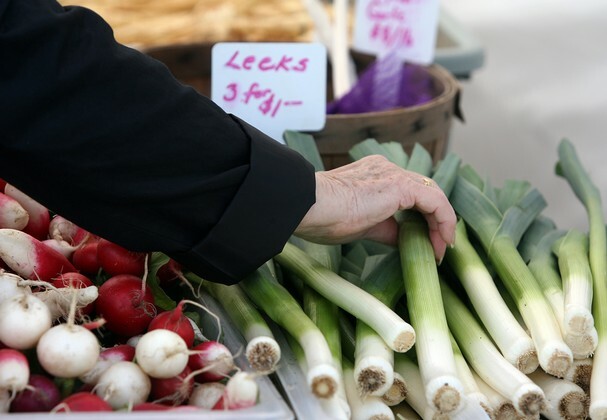 Online food preservation and safety information is available on the WSU Kitsap Extension website (http://county.wsu.edu/kitsap/agriculture/food/Pages/default.aspx). Pressure gauge testing is available by appointment for a $5.00 fee. Gauges should be tested annually. A bunch of my friends have reclaimed sit-down Sunday Dinners by posting their menus on Facebook. If you do a big sit-down it is a chance to see if you measure up, if you just graze on left-overs from the week after church, it is a bit ego-busting! While we do the full meal deal periodically, Sunday sit-down’s aren’t a tradition at our house – but Saturday Farm Breakfast is a big deal! Most of my kids have moved on to other adventures, but we still do the Farm Breakfast for the hay crew, hubby and the occasional hay customer who has figured out what is going on! Recent offerings include buttermilk pancakes with fresh raspberries, french toast, breakfast casserole (eggs, potatoes, sausage, bacon, onions, peppers, cubed bread), eggs and hashbrown potatoes, and of course, biscuits and sausage gravy. I couldn’t do this without the farm. Eggs from the chickens, milk from the cow, pork sausage and bacon from the hogs we raise, potatoes and veggies from the garden, and buckets of raspberries from the berry patch make all this possible. Without this ultra-local bounty feeding 4-8 people every Saturday morning would be cost prohibitive but my girls (Lexie and the chickens) keep up their end of the bargain. We’ve been blessed with a bunch of great helpers over the years – and the community we have built around the kitchen table has forged relationships that are why we keep doing the hay business – and the Farm Breakfast! This week it was fresh chorizo, eggs, beans, rice, homegrown salsa, and tortilla! Next week it is biscuits and gravy with fried red potatoes and eggs – by request. Carlos is moving on to a new adventure as he leaves to go on a church mission for two years! We will miss him, but when he comes home I am sure he will join us again for an occasional breakfast! They always do! Here is the recipe for the chorizo – it is also great for a quick taco dinner! I always have the butcher grind my pork and leave it unseasoned when we do a hog – that gives me lots of flexibility in meal planning. You can have most butchers grind up pork shoulder and do the same thing or buy some boneless pork spareribs and grind it yourself. Grind the meat if needed, blend spices, pour over ground meat, mix well with hands. Best if it can sit in the fridge 24 hours to allow flavors to blend before using. Fry it up and make a breakfast burrito! 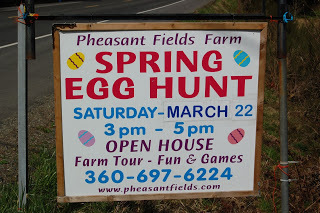 A while back Dragonfly Nursery and Farm in Hansville ran afoul of county ordinances for their signage (among other things) and it brought up yet again the tenuous position many farmers in which many farmers find themselves. I commented recently that every farmer I knows breaks the rules – somehow, someway! There are so many federal, state, and local regulations that compliance is incredibly challenging. Worse yet, many farmers often don’t know that they are breaking the rules. There is a public hearing on the interim sign ordinance TONIGHT. If you are a farmer and want to speak out about how this ordinance helps you and your business, now is the time! The hearing takes place at the regular Board of Commissioners public meeting at 5:30 p.m. in the Board of Commissioners Chambers, 619 Division Street Port Orchard, WA 98366. Written comments can also be submitted to the DCD point of contact Katrina Knutson, KKnutson@co.kitsap.wa.us or (360)337-5777. Vintage is in…totally. There are etsy shops, tag sales, Facebook pages, storefronts, museums, ..all dedicated to vintage wares and lifestyles. You can hardly turn around without bumping into an instagram photo of a toddler in a wading pool taken yesterday but looking for all the world like circa 1974. I get it – because I love the kitschy, whimsical, and fun bits and pieces of a life gone by! But while it takes us back to a simpler time, remember there was no etsy, Facebook or instagram then! Those orange floral dresses and bouffant hairdo’s were real life! We lived it and wore it and worse yet, thought it was hip and tasteful! On the farm we have lots of vintage stuff as well – the 1930s vintage Allis Chalmers tractor that belonged to my father-in-law, the 1960s vintage International B-414 tractor that belonged to my dad …. 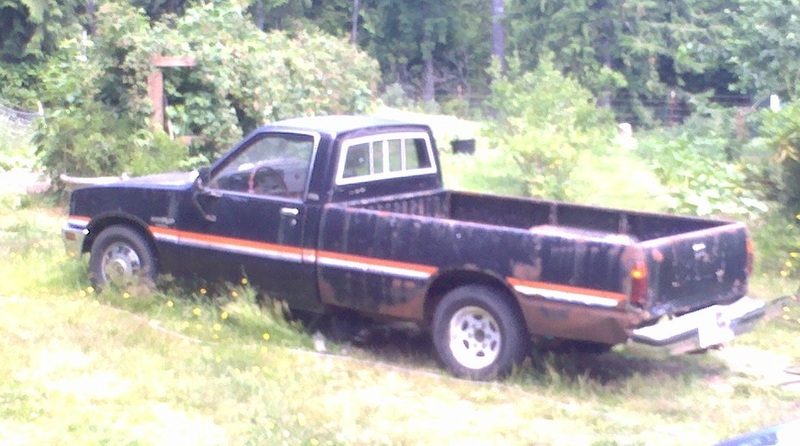 and the 1980s vintage Isuzu pickup with more than 300,000 miles on it that my husband loves and refuses to part with. Now, the tractors have both been rebuilt and run well. As for the Isuzu, well it runs, but not well. The seat is sagging, the floorboards are leaky and when you turn on the heater/defroster the cab fills with an obnoxious blass of antifreezy air that promptly fogs up all the windows (which rather defeats the whole “defrost” function!) I think that there must be a hole in the heater core. All this makes rather entertaining driving during the winter. Old stuff on farms is nothing new. Years ago when we were making hay down in Lewis County at my mother’s farm my son had a friend come and spend a couple of days. James and Trent were about 10 or 11 and thought they were in heaven. Haymaking took several weeks so we moved the entire family down to the farm and the kids enjoyed long summer days playing while the men made hay and I cooked and drove tractor! My mom still owned my father’s old pick up truck and we used it for pulling wagons and short trips into town for tractor parts and the like. It was the quintessential farm truck – dented, smelly, even more beat up than the Isuzu. Someone had removed the bench seat and replace it with bucket seats – that were sort of attached to the frame of the truck but came adrift occasionally – just often enough to make turning corners a bit interesting! The person sitting in the middle perched on a block of firewood with an old pillow on it. In defense of the mechanic who made the change – he did leave the seatbelts in it! James and Trent (who was probably sitting in the middle at the time!) and I made a run into town one day and as we were sitting at the stop sign (Toledo doesn’t have a stop light!) waiting to turn and head home Trent said, “Mrs. Fish, why does everyone here drive junky trucks?” I looked around town and sure enough, there were more than a couple farm trucks parked along the street! I explained that farm trucks work hard and don’t always get taken care of the best but they run just fine. The contrast between vehicles on the farm and in the ‘burbs was pretty noticeable – even for a 10 year old – but because of the need to be thrifty every bit of use and life was squeezed out of vehicles and machinery! And, when it didn’t run anymore chances were it got parked out back where it became part of the “strategic reserve” and stripped for parts. This spring my mother had a stroke and had to leave the farm where she has lived since 1978. We stopped making hay on the place about 10 years ago when it was divided up into five-acre parcels and sold for building lots. Now, the neighbors still mow the old hay field with John Deere tractors – only they are lawn tractors instead. Cleaning out Mom’s house was a bitter sweet experience. So many lovely memories of summers in the shade of the huge oak trees, long hours spent exploring the woods and swimming in the river, the sweet smell of hay as you entered the barn to feed the cattle during the winter. It was sort of like a bit of July during the cold, wet months of winter. My middle son was especially sad about her leaving the farm and the apple trees that he loved to climb in and so we are going to get some scion wood from them in the spring and visit the Peninsula Fruit Club‘s spring grafting show! We will plant the new apple trees in our orchard and perhaps our grandkids will get as much pleasure from them! As I was packing up the bits and pieces of her life I thought a great deal about the current fascination with vintage items. Since my mother embodied the adage “Use it up, wear it out, make do or do without!” her entire life was vintage! However, rather than being displayed on a shelf or being a “decorator accent” these items were used every day! All her pyrex dishes and bowls were chipped and stained – not museum pieces but kitchen workhorses that served thousands of meals for her family. There was precious little to send to thrift stores or garage sale. It was all worn out! I packed up a few boxes of keepsakes and precious mementos, but there was very little worth saving. I kept her recipe books, a few dishes and heirlooms, and some linens. In the bottom of the kitchen towel drawer I came across a few worn but serviceable items. 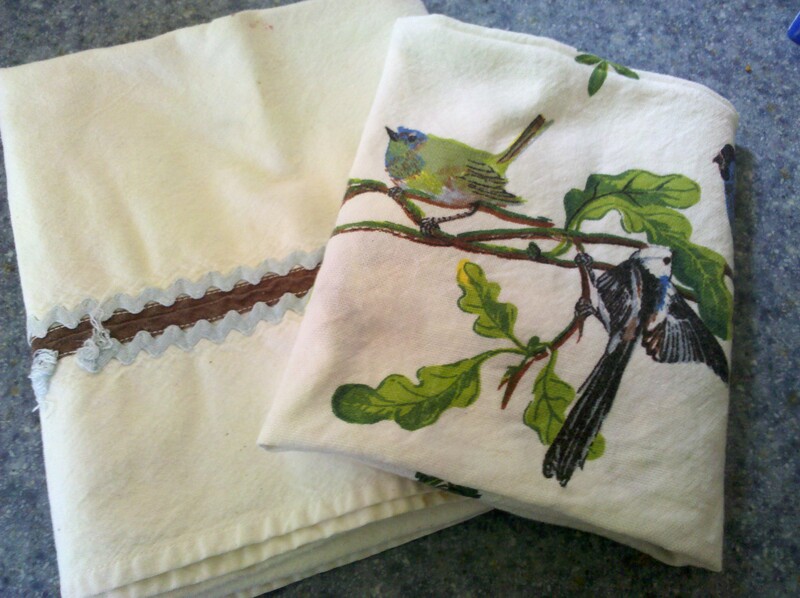 One homemade muslin dishtowel had a bric-a-brac trim sewed on by Mom years ago. I brought it home along with a couple of others – and put them in my towel drawer – because these things were made to be used, not just displayed on a shelf. According to weather guru Cliff Mass we are warming up! That is good news for local farmers who have been battling unseasonably wet weather the last couple of weeks! A rare summer atmospheric river brought thunderstorms and lots of moisture to the area. We are used to this phenomena during the winter months here – though we get enough rain so that perhaps you hadn’t noticed it! But, it is rare during the summer months – as Cliff explains! We need the warmer weather – berries and cherries have suffered this year due to the rain. Talking to a friend who farms cherries in Eastern WA and last week they took pickers into the orchard to see if the crop could be salvaged. They left after a couple of hours. Depressed and tired, he was philosophical. “You win some, you lose some in farming!” Local strawberry farmers have also been battling the weather with high losses due to mold on berries. Both berries and cherries are high value crops, and with high value comes a high risk! Other farmers report damage to locally grow early maturing garlic as well. When garlic is just about ready to harvest it needs a couple weeks of warm, DRY weather to cure and lots of rain during that time can cause mold damage and reduce storage life. Later maturing varieties should be better off with the warm spell forecast! My garlic isn’t quite ready yet…but not because I am some weather predicting savant. I was just so late getting it planted that it is later maturing! Sometimes being too busy to farm is a good thing. Regretfully, this spring the weeds have taken over a couple sections of the garden, so procrastination isn’t always the best way to manage! Farming certainly isn’t for sissies. In one regard the wet weather has been good…transplanting tender young plants in hot weather is challenging and cool damp days are the best. But, with all the rain we have had it is lucky that it hasn’t washed away! Farmer Nikki over at Pheasant Field Farm has been busy making raised beds and putting out crops for her fall CSA and market customers. Kale, cabbage, cauliflower! Busy canning, freezing and putting up right now. I keep meaning to put together a blog post, and I have composed 100s in my head, but regretfully they haven’t come up with a way to plug the USB cord into my head! 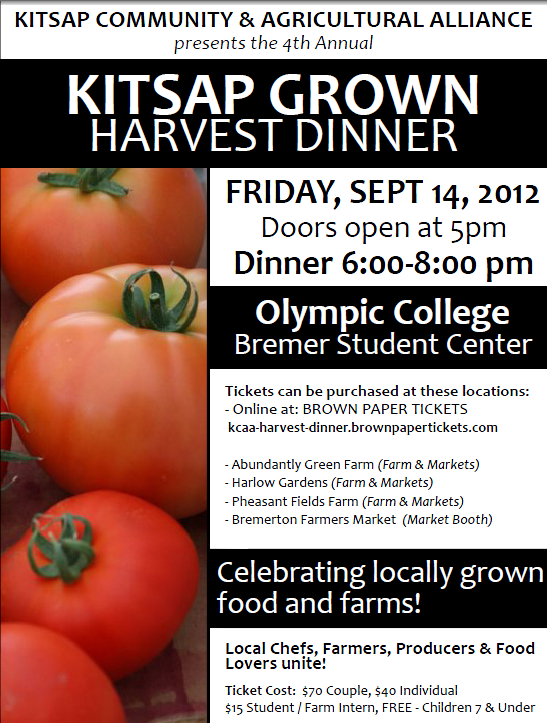 While I am neglecting my farm to fork responsibilities you have the chance this fall for a REAL Farm to Fork experience at the Kitsap Community and Agricultural Alliance Harvest Dinner on September 14th. Whether you are looking for a cool date night, want wonderful local food prepared with care and attention to detail by talented chefs, or are looking for a chance to rub shoulders with the local farmers who feed us, the Harvest Dinner is the place to be!